In 2007 we started as the first company in the Middle East with Medical tapes and courses. 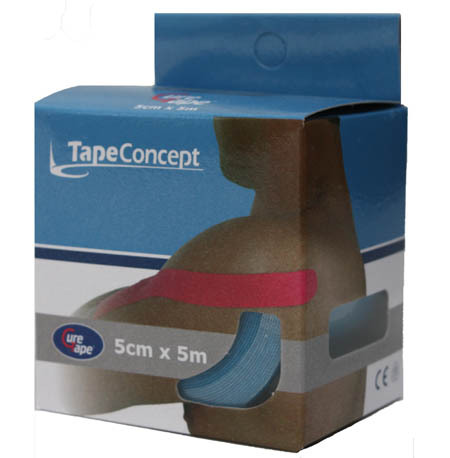 Our brand and packaging is well known with many physiotherapists and Health Care professionals. This year we updated, renewed and improved the original packaging to be ready for the future requirements in the Health Care industry. We have used feedback of our customers, included the latest developments and requirements of the Health care industry to come to the new design, which is similar to the packs you are all so used to. All our packs/rolls have lot numbers, all printed on the boxes. The TUV quality logo from Germany is printed on the display boxes. We are the only company who has this quality logo. 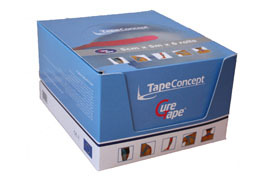 All display boxes have colour stickers, with text, to show which Curetape colour roll is inside the box. The Arabic text and description how to use the tapes is now incorporated on all display boxes instead of having stickers on the boxes. We are the only company who has special packaging for the region, which is up to the latest standards of the hospitals/clinics in the region. The carton used for all the boxes is stronger and of better quality. In that case the rolls will be better protected against heat, dust and humidity. Your product will stay longer fresh! We have updated the colours and have a more brighter and attractive look from the outside. Of course the Curetape rolls are still produced in our factory under the same tight and secure quality standards. We stand for service, long term commitments and of course the QUALITY brand Curetape. If you have ideas too, feel free to contact us. We welcome all comments, which might be used for the next versions. The quality and manufacturing team of TapeConcept Ltd.